The 1986 French Grand Prix was a Formula One motor race held at Paul Ricard on 6 July 1986. It was the eighth race of the 1986 FIA Formula One World Championship. Following Elio de Angelis's fatal testing crash on the full 5.81-kilometre (3.61 mi) circuit two months previously, a decision was made to use the shorter, 3.812-kilometre (2.369 mi) "Club" circuit for this race and for future F1 races (up to and including 1990). This eliminated the high-speed Verrerie bends, where de Angelis had crashed, and reduced the length of the Mistral straight from 1.8 km (1.1 mi) to 1 km (0.62 mi). Nonetheless, the cars still recorded speeds of over 330 km/h (205 mph) on the straight. The 80-lap race was won by Nigel Mansell, driving a Williams-Honda. It was Mansell's third victory of the season. Alain Prost finished second in a McLaren-TAG, with Nelson Piquet third in the other Williams-Honda. Ayrton Senna took pole position in his Lotus-Renault, but crashed at Signes early in the race after sliding on oil laid by Andrea de Cesaris's failed Minardi. This race marked Scuderia Ferrari's 400th start in a World Championship event as a team. ^ "Motor Racing Programme Covers: 1986". The Programme Covers Project. Retrieved 21 October 2017. ^ "1986 French Grand Prix". formula1.com. Archived from the original on 13 November 2014. Retrieved 23 December 2015. 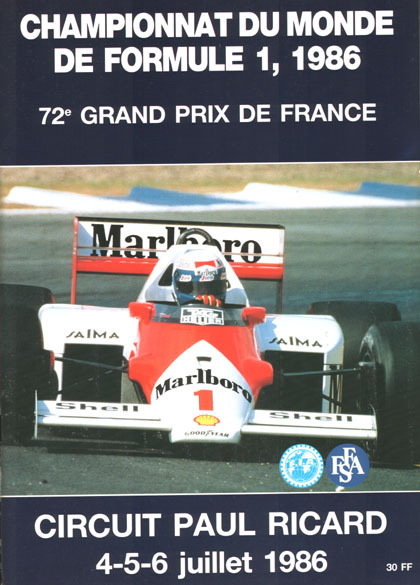 ^ a b "France 1986 - Championship • STATS F1". www.statsf1.com. Retrieved 17 March 2019.